Mayor Marsalis' son has been found dead in his apartment. The killer's left him naked and in a position identical to Linus, a character from the comic-strip Peanuts. Ex-cop Jordan is called in to investigate the death and soon there are a string of other deaths replicated in the same way. Along with Italian investigator Maureen Martini, Jordan must find the murderer before other characters are killed. One, the idea of moulding a well-known cartoon strip into something so sinister. I would like to award Faletti with an award for creativity because I would never have thought that Snoopy and his friends could play a part in a murder mystery And two, the reason for the title, which I really can't explain cause then it just ruins the novel. To put it simply, sometimes you just have to see it to believe it. Like his other novels, Faletti's able to introduce a number of characters that somehow interlink with each other (sometimes by a bit too much coincidence) without making the plot confusing. The characters are there for a reason, whether to help solve the mystery or help the development of a character. They're not fleeting and suddenly forgotten, they're introduced and stay till the end. Faletti is able to develop his characters quite well despite the limited timespan the novel is set in. There are certain attachments that can be made with the characters and surprisingly, I felt it with the minor characters more than the protagonist. I love the fact that everyone is flawed in this novel. Everyone including our hero. Even the victims who you are suppose to feel sympathy for actually leave much more of a bitter feeling. While reading a Faletti novel there is a lot of deducing that will happen and sometimes I'm so certain it'll be this person, but with The Killer In My Eyes no matter how much I thought about it nothing seemed plausible. So when the major revealing happened I was surprised but also a bit confused. You know the whole, where did this come from, which (thankfully) the plot explains later on. It was unexpected in the fact that you just never pinpoint that character in the first place. I guess that is a successful aspect in writing a crime novel, the unexpected moments are always the best. This is the third novel I've read from Faletti and I have to say I held high expectations. I've always admired his talent in springing the surprise at the last minute, making the mysteries so much more thrilling. 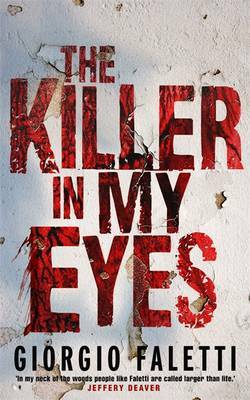 The same happens in The Killer In My Eyes but for some reason it just didn't create the same reaction I had with his previous works (see reviews for his other novels here). That's not to say it was bad, it just wasn't his best. I still thoroughly enjoyed it though, majority of it was great. For a tiny portion it was a bit slow paced but I guess it needed to start building the intense again instead of just being on a high the entire time. Most of the time if an author sticks with a particular genre their novels just seem like a carbon copy of each other, just with different character names and setting. With Faletti everything is different and that's what I love about his style of writing. It's always something new that has you completely engaged. Grab a copy and settle down because you'll be sucked into the story before you know it.